Where is Jachtfontein? And what is Jachtfontein (sometimes also spelled Jagtfontein or Jagfontein, that is on the sign posts)? Calling it a village would be a bit much, a settlement is a better term. What we found there is a cemetery, a shop, a small church and lots of history. 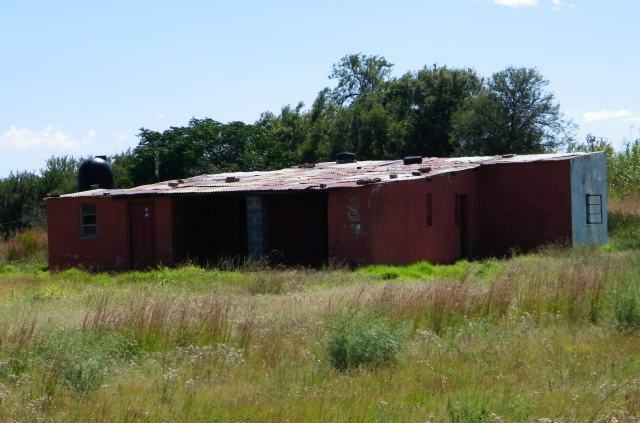 It is situated on the road (actually off the road) from Vereeniging to Randfontein in Gauteng, just before you get to Westonarea, coordinates: -26.423° 27.732°. The main road (well, the only road) going through the village used to be the connection between Potchefstroom and Johannesburg. First point of interest we noticed coming in on the road was a well kept grave yard. 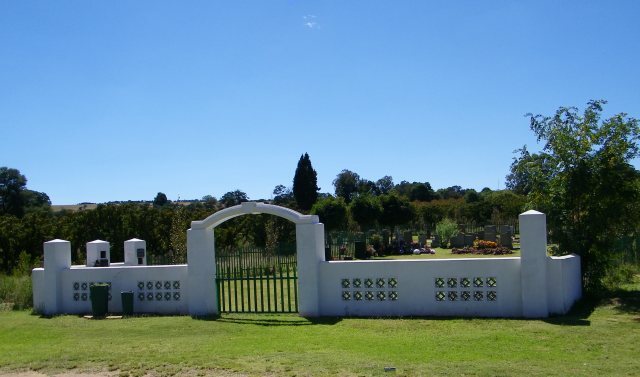 Its the cemetery of Jachtfontein, it is privately owned and contains amongst others the bones of the first trekkers who settled here, GP Brits and his wife. GP came up from Philipolis in the 1840's and settled here at Jachtfontein. It was a pleasant place with a strong spring and soft ground. 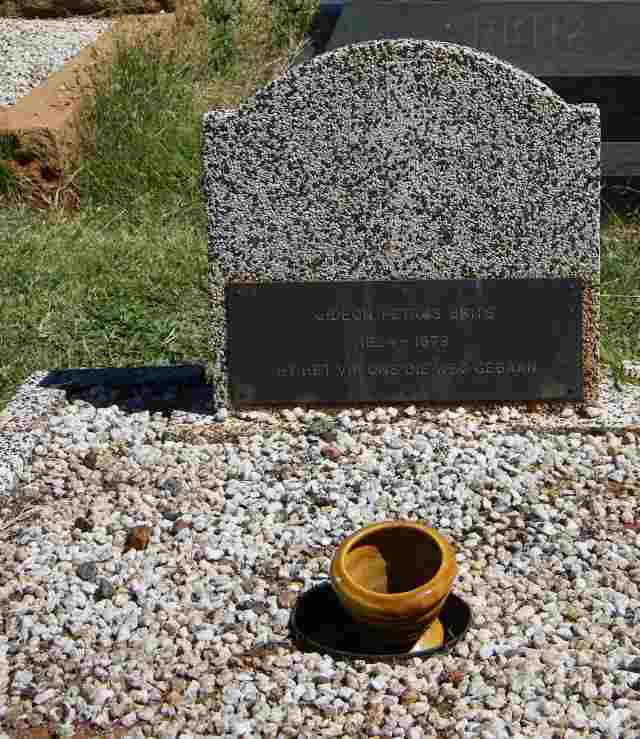 The inscription on his grave 'Hy het vir ons die weg gebaan', he opened the route for us. 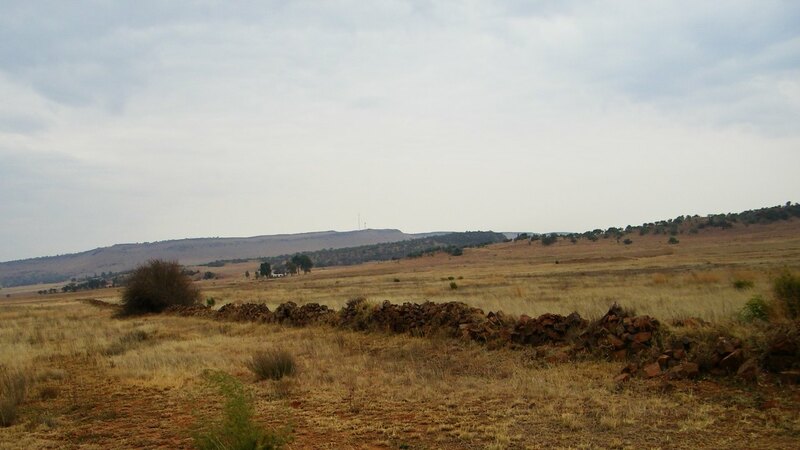 Also of note are the mass graves of the 'witseerkeel' (diphtheria) epidemic of 1890 and the flue epidemic of 1918. This story has been passed on from Maria Susanna Elisabeth Brits (ne van Wyk) (Ouma Malie), wife of Gideon Petrus Brits and also contemporary and neighbour of Jan Thomas Maartens (this is how the name is spelled in the manuscript). Told to her grandson Daniel Lourens Brits and written down by Cornelia Susanna Brits (ne Klopper) in connection with Jan Thomas Maartens. After gold was discovered on the Witwatersrand a carriage service was introduced between Potchefstroom and Johannesburg. On the farm Modderfontein were stables where the horses could be exchanged. There was also overnighting facilities, as well as a bar. The building is still standing, see picture below. 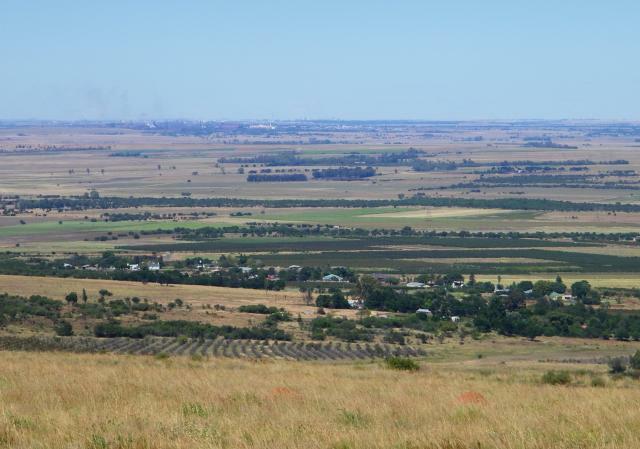 Jan Thomas Maartens was at that time a young man and a inhabitant of the neighbouring farm Jachtfontein next door. He was a regular customer of the bar and fairly often got home drunk. Tommie, an Englishman, was one of his regular drinking partners and one day he brought him home because he had no place to stay. Thomas's wife Meraai placed a a meal of offal in front of him. His eating habits were disgusting with offal hanging out his mouth as he was eating. Thomas became very distressed at the bad manners shown by Tommie and wanted to know from Meraai whether he also behaves like this when he is drunk. Her answer was that this is nothing, he behaves even worse, with at times throwing the whole plate under the table. This affected Thomas so much that for three days he sat under a thorn tree behind the house deep in thought and prayer. Here he promised that if God helps to free himself from the drinking devil that he will build him a church. God heart him and relieved him of this burden. Thomas kept his side of the bargain and build a church next to his house. It was a small church with a flat roof. This church was burned down during the Boer War, re-erected and made somewhat larger and put back into use in 1905 through the initiative of Thomas's son. A more complete description of the history of the church building has been framed and is hanging in the church. The difference in spelling of the name, I think, was just a mistake made by the author of the memoirs. In the church and in the graveyard the spelling is Martins. 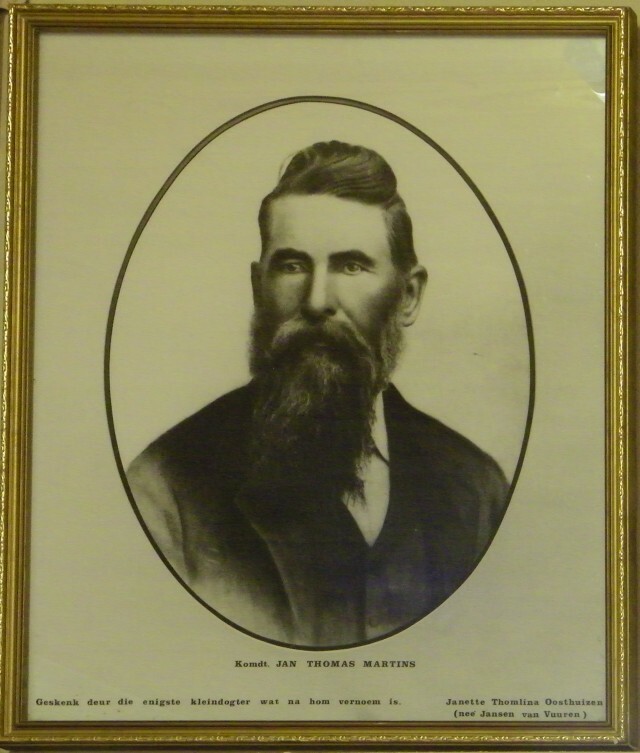 There is more to Thomas Martins than just the church story. During the second Boer War he was a Kommandant serving under General Cronje. JT and many of his commando, as well as general Cronje were captured by the British during fighting near Kimberley in February 1900. JT was sent to St Helena, where he died. 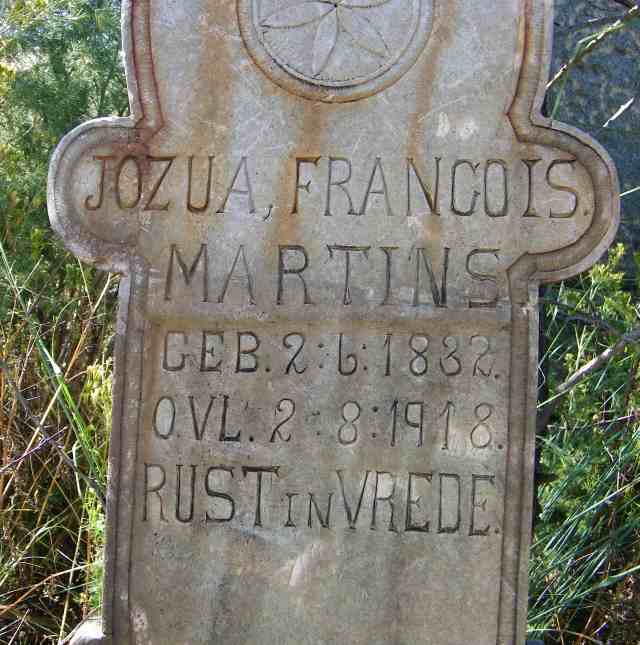 On the farm Modderfontein is the graveyard of one of the Martins family and here we found the oldest head stone dedicated to Jozua Franscois Martins who was born in 1832 and died in 1918. It is unlikely that he was the original trekker, he would have been a child at the time of the trek. Another name mentioned in the reference is P. Martins. 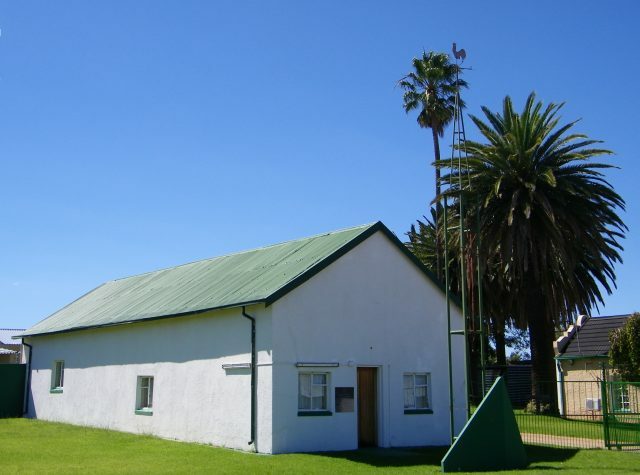 He was an assistent veldkornet and was sent with his commando from the gathering at Paardekraal in 1879 where the independence of the Transvaal was re-declared, to Potchefstroom to protect the place of the printing firm JP Borrius where the declaration was to be printed. 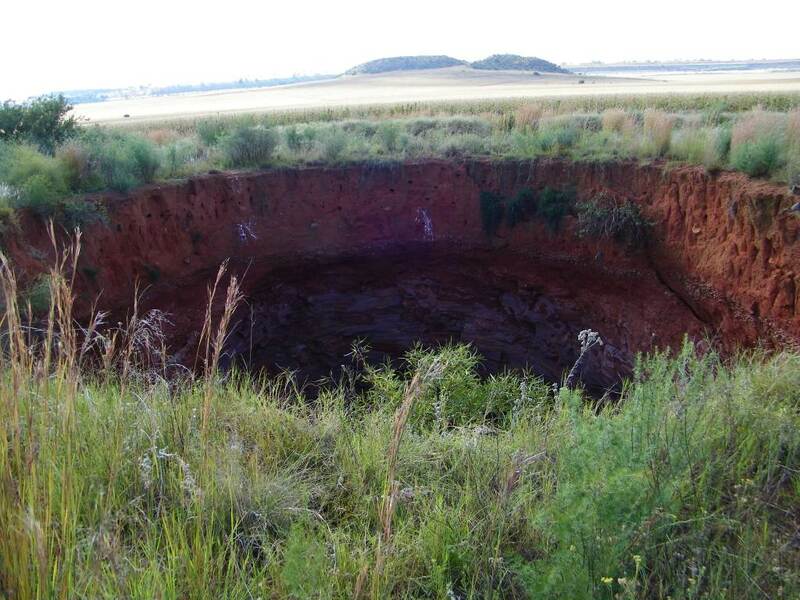 Going up the ridge to the north of Jachtfontein and looking down on the fields below one will spot a few circular shapes, these are sink holes that have fallen in very recently. Rudi, the farmer, tells us that he went over the area with his planter the day before and over night it fell in with lots of noise and the earth shaking, that was December 2001. According to the club records actually a bit earlier, 1998. A few weeks after it had fallen in cavers from SASA went down to about 50m and reported a very muddy and dangerous environment with no access to any tunnels that could have led into the vast caverns that should exist in this dolomitic underground. The picture of the sink does not really do justice to the scene, I didn't dare get close to the edge because the earthy sides are still shear and could crumble at any time. The hole has been entered again and this time it was found to be open at the bottom, leading down into a huge chamber and a major rift. 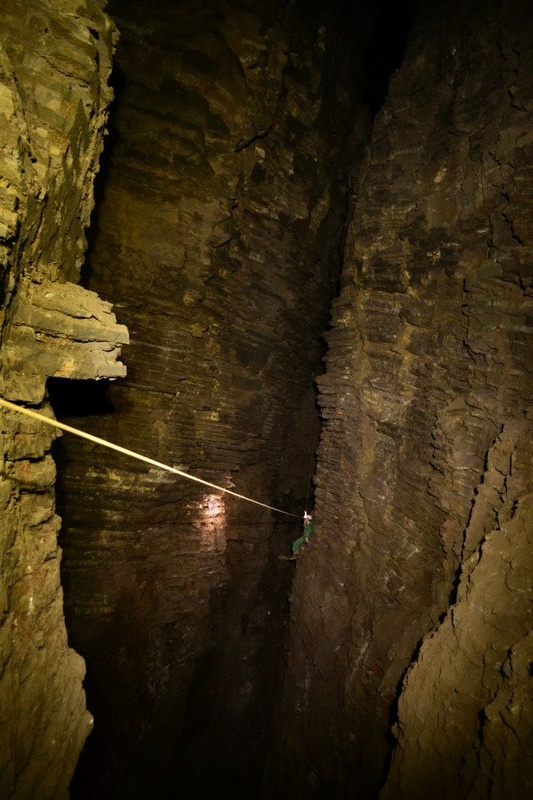 Click on the video is of a caver descending down the 50m to the bottom. A major system was awaiting the cavers as can be seen from the picture (by Andre Doussy) 200m down below. Also on the 'other' side of the mountain, where the sink holes are we found the great wall of Jachtfontein. 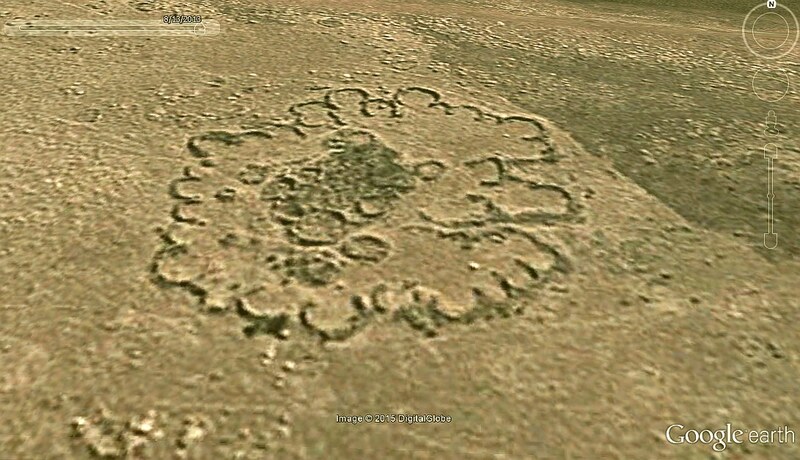 Best is to check it out on Google Earth, the north-west corner is situated at 26.370961°S and 27.74864°E. 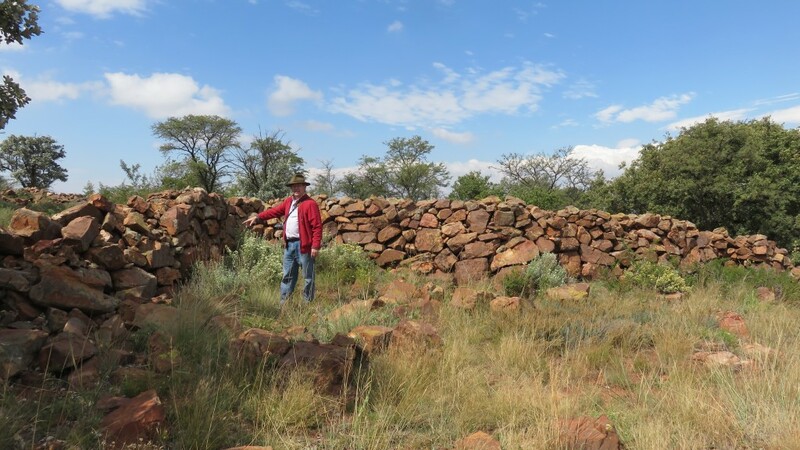 It is a wall build from stones, one can see this type of construction fairly often, but then it is a small kraal to keep sheep and cattle in for the night. One of them can be seen a few meters to the north-west from the indicated point. This one is roughly 220 by 350 meters, covering an area of 7.7 ha. One can only wonder how many years it took the farmer using an ox-wagon to cart stones from the hills to construct the wall. The purpose was obviously to enclose some land for crops, keeping game and cattle out and I would guess this was done during the 19th century when fencing material was just not available or to expensive. What these ruins are I am not sure, but they are extensive. Google Earth shows them very clearly. This was not just a few huts, it was a major settlement. And not that old, the walls are still fairly well preserved. I would guess 200 years. The image from Google Earth shows just one of the structures, and there are many of those on the hill. References: 'Wyk Gatsrand en se rol in die militere aktwiteitte van die Zuid-Afrikaansche Republiek', Military History Journal, Vol 10 No 1 - Junie 1995.